Upwork (previously Odesk) is a marketplace for anyone to connect with freelancers to get almost any job done. If you have a special skill or the ability to learn one, then you can make a decent amount of money online from Upwork. Upwork features a number of jobs that you can get hired to do from accounting to web design. Luckily, you are reading this article and I have made over $100,000 from Upwork alone (not including jobs I get outside of Upwork from previous clients met through Upwork) and have a Top Rated 97% Job Success rate. In this article, I am going to show you how you can make over $100,000 a year with Upwork and some great ways to get there faster. Now that you are ready to get to work and start making some money, its time to get everything set up. In order to do good on Upwork, you will need a good internet connection and access to a computer. If you have a laptop as well, that will help you be able to work from anywhere. Upwork is a popular marketplace that matches freelancers with clients looking for all different kinds of jobs online. You can hire anything from a CPA to an engineer and everything in between. Clients can post jobs for free and freelancers use credits (purchased with money) to bid on jobs. The whole project is handled through Upwork’s system. You can message the client, take payment and do the contract all through the Upwork system. 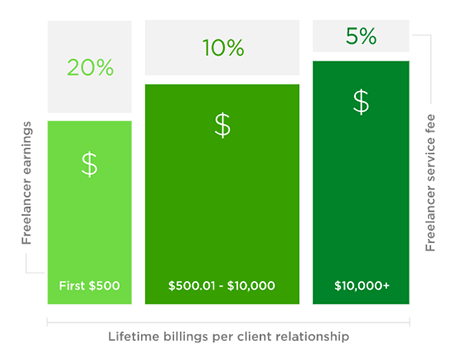 Upwork takes a small fee for each project of about 20% of the project price. So if you get a $1,000 project, Upwork will keep $200. This is a little high in my opinion, but they reduce the fee with long-term clients and projects over a certain amount of money. Here is the Upwork fee graph that shows the percentage taken out by Upwork for each project size. This is a fee that I am willing to pay because I have gotten a ton of great long-term clients from Upwork that have moved outside of Upwork. I know that this is technically against the terms, but I do a considerable amount of work with someone in Upwork before I will work with them outside of it. Before you do anything, I would highly recommend registering a legal business entity in your local state. Which type of business is really up to you but I would suggest an LLC (limited liability corporation) so that your personal and business is kept separate and you are not liable for business losses or anything else that may happen. Trust me, I have almost been sued a couple of times and it’s worth the $200 or so to register a business. Once you have your business registered, you will need to go to IRS.gov and register an EIN (employer identification number). This is kind of like a social security number for your business. It is how the IRS tracks what your business’s revenue is for tax filing purposes. Next, you will need a bank account so that Upwork can send you payments via escrow. Go to your local bank and set up a business account using your Business and EIN. Make sure to bring the EIN and business entity number to the bank. Ok, your bank account is set up and ready to start flowing with cash. Now its time to sign up to Upwork and create your profile. Your profile is the most important part of getting jobs online with Upwork. It must be professional, catchy, engaging and build trust with the clients and people looking at it. Add a really high-quality photo of yourself that will make your profile stand out. Don’t take a picture with a Nokia flip phone in your mom’s dark basement. If you have to hire a photographer for $50, it’s well worth it because the profile photo is what catches their eye. If you look at my Upwork profile photo, I dressed in a nice suit (doesn’t happen often) did my hair up good and took a photo in front of a really cool building by Tyton Media. It really makes my profile stand out at first glance because of the purple background. Make sure that you smile and seem inviting so that people are more willing to reach out to you. If you do not have a Upwork profile photo, I can almost guarantee that you will not win any jobs. Using buzz words and symbols in your profile title can catch the readers eye so that you can get them to read your description. As you can see from my profile title, I add **USA** so that people know I am from the USA. This has helped increase my USA clients by over 30%. I also add WordPress and Marketing Professional because those are my areas of expertise. It’s important to just focus on a few areas and even just one area if you can. Your Profile description is super important for building trust and telling the client who you are what you do. Be sure to talk about your mastery status, years of experiences, any accolades, and don’t drag it on for too long. I would say 300-500 words should do it. People are looking at a ton of proposals and don’t want to read a book about yourself. Here is my Upwork profile description that is too the point and showcases my great ratings, and ability to save clients money by providing a good product. Having your portfolio filled out is really important in building your Upwork profile. People want to see your past work and experience so showcase all of those awesome things you did or do some awesome things that you can showcase here. Building your Upwork rating will take time, but it’s probably the biggest deal on your Upwork profile. Like ratings on Amazon, people base a lot of their decision on how your ratings are on your profile. Later in this article, I will show you how to get more ratings and reviews. In Upwork, you can take online tests to prove your skills at your craft. They have thousands of different tests you can take from accounting tests to coding tests. These will test your skill and allow you to show your tests scores on your profile. Take as many tests as you can in your field and try to ace them so you can showcase that on your profile. Here are some scores I got from taking these takes in a few minutes. Be sure to allow enough time so that you can finish the test in the time allotted. You can also take the test over and over as many times as you want, so study up and ace those tests. To make money at something you have to be good at it. In order to make six figures or more on Upwork, you will need to be a master at something. I suggest choosing something and just going with it. I taught myself coding and web design 13 years ago when I was 18 by just reading and learning how to do it online. 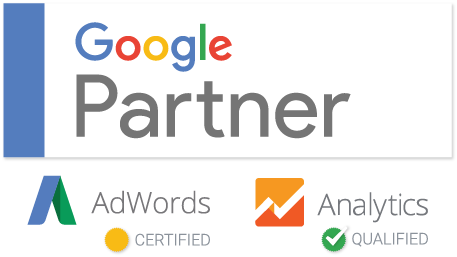 Through the years I have built and grown hundreds of websites, taken classes, gone to conferences and grown my knowledge to be a master at digital marketing. These cover pretty much any job area so if you skilled at pretty much anything, you can make money. If you are a good writer, you can make six figures on Upwork. There are thousands of jobs posting every day and the supply of clients in there. There are thousands of jobs posted in Upwork every single day. Now that you’re a master of your skill, it’s time to find some jobs on Upwork based on your skill. A lot of people make the mistake of bidding on anything that they think they can do but this will spread you thin and actually take you more time to finish projects, You want to be doing the same thing over and over so that you have a process to your projects. This is the only way to make six figures on Upwork. You also want to conserve your proposal credits because they do cost about $2 per proposal. There are a number of things to look for on the listings to know if you want to submit a bid or not. There are some good things and bad things about this listing. The good things are that it’s a United States person (and I’m in the United States) and they are only looking for US freelancers. But I would not bid on the project for a few reasons. First, is that the client’s payment method is unverified. This means that they haven’t added a credit card or bank account to Upwork so they probably aren’t really serious about moving forward. They have also spent $0 on Upwork and have no rating at all. It could be a fake listing or just someone who is looking for some bids to compare. If you stay away from these, you will save your credits for people who are ready to pay. To filter out all the bad listings and only show the good ones, you can create search filters to only show you the gems you want to see. Depending on your experience in Upwork, you can change the filters to show jobs you are more likely to bid on and filter out any ones you won’t. Simply go through the listing and click the heart icon to save the listings to your saved jobs list. This will make bidding on jobs a lot faster and streamlined. You can catch yourself looking at the job feed over and over again which is not very efficient. Look at the feed 2 to 3 times a day and save jobs into your saved list instead of reloading the feed over and over. There are two different types of projects in Upwork and both are very different. Hourly projects allow you to run a clock that watches your computer screen and you get paid hourly for whatever work you are doing. Fixed projects are projects that have a fixed price. The client will set a budget and you will bid a flat price based on that budget. Both fixed price and hourly projects have their pros and cons but its best to get both types of projects if you can. 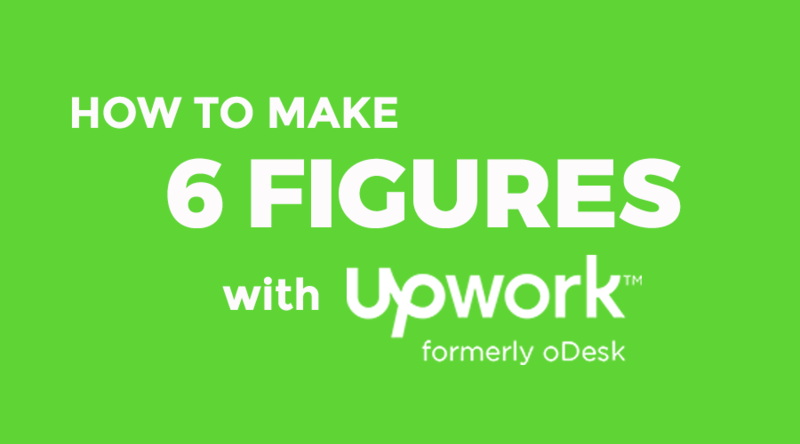 Having a constant flow of projects is the best way to makes six figures with Upwork. To have a constant flow of projects, you will need a constant flow of proposal being submitted… and won. When you first start out on Upwork, it’s going to be a little difficult to get jobs. With service-based businesses, people want to trust the person and see a good track record of business. If you don’t have any ratings or a portfolio on Upwork, how is someone going to hire you? Everyone starts somewhere and there are ways to get jobs on Upwork without any ratings or reviews. First, you need to have a website for your business that includes testimonials, case studies or a portfolio that shows past work. If you don’t have any of this, its ok to create some fakes one to get going. 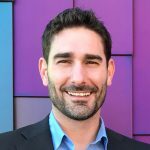 My name is Tyler Horvath and I am an expert Web Designer and Digital Marketer with over 13 years experience from Kansas City, USA. I am pretty new to Upwork but not new to creating amazing websites. I know that I do not have any reviews yet, but if you check out my portfolio you will see that we do really great work! I would love to chat more about your project! To win projects on Upwork, your proposals should be to the point, showcase your skills and build trust and authority with the client. Bonus tip: You will need to bid really low when you first start out. People are more likely to choose you if you give them a lower bid. You will need to work your way up to the high priced items. Once you have a good base of positive reviews, you can start going after bigger and bigger projects. You will also need to build your ratings up so that you stand out above the rest. This means both being good at your skill as well as customer service. You will have to work with a lot of different types people and some are a little hard to work with. If you can get 5 stars on all of your projects you will see a large increase in won proposals. If you truly are a master of your craft, then they will have to choose you. So make sure that you really are the best out there by learning, reading and mastering your skill. This entry was posted in Digital Marketing, Internet Business. Bookmark the permalink.